sporting built-in GPS, we're running out of excuses for showing up late. And we wanted to find out which smartphone navigation application will get you to your destination fastest. For this contest, we grabbed two of the most capable smartphones on the market: Apple's iPhone 3GS (AT&T) and the Motorola Droid (Verizon). Both feature large, touch-sensitive displays and robust processors that can handle serious computing tasks. More important for this test, both have GPS receivers that work with full-featured GPS navigation apps. This is where the differences start: While the Droid comes with built-in Google Maps navigation for Android 2.0, the iPhone's top GPS tool is the TomTom for iPhone, a $100 download from the App Store. The features of these two products are so eerily similar that it's a no-brainer to make a head-to-head comparison. For our test, we took the Droid and the iPhone 3GS on a wild, Bullitt-style ride through the streets of San Francisco. With the same destination entered on each device, we took wrong turns, changed directions, and made a generally erratic spectacle of ourselves that bordered on public menace. As we drove, we kept a close eye on each unit, noting which updated routes faster, which provided the most effective directions, and which offered the most helpful turn-by-turn instructions. TomTom's fully-loaded GPS app costs an eyebrow-raising $100, but it does give the iPhone enough navigation features to rival most stand-alone GPS devices. The program supports the iPhone 3G and 3GS, and it can also be used on the iPod Touch in conjunction with the optional TomTom Car Kit ($120). The app takes up 1.3GB of the phone's built-in memory, which forced the owner of our 16GB test unit to delete a bunch of music files from the device before installing it. TomTom for iPhone uses the iPhone's 480-by-320 touchscreen to full advantage, offering turn-by-turn, voice-guided navigation with both 2D and 3D maps. The home screen lets you choose between a few options: You can enter a destination address, select a recently-used destination, search for a point of interest, select a point on the map, or pull an address out of your contact list. We particularly liked the intersection interface for entering addresses. The app narrows down the list of available cross streets to include only those that intersect with the primary street you've entered. In a big city, this greatly simplifies entering your destination; you don't have to scroll through a seemingly endless list of streets. Out on the road, TomTom's 3D maps offer a clear view of your immediate route that make it easy to spot your next turn without taking your eyes off the road for very long. Meanwhile, the voice guidance includes helpful information about the distance to the next turn, so you know whether you need to get over immediately to make that left turn in 300 yards, or whether you've got a half-mile to go. TomTom's voice guidance helpfully gives you the next two turns in advance, as in "Turn right on Fifth Street, then left turn." We did encounter several GPS signal failures during our drive with the iPhone 3GS. These occurred mostly in narrow alleyways that obstructed our line-of-sight to the sky. The Droid, however, made no corresponding complaints about loss of signal at such points, and kept on navigating without interruption throughout our test. We don't know whether this difference in GPS continuity was due to hardware differences between the devices or to tolerances for signal loss in the apps. But for practical purposes, TomTom for iPhone was slightly less effective than the Droid's app at maintaining a seamless guidance experience through the city. We should note that we tested both phones without any optional hardware, such as a mounting device or car kit. However, users who opt for the TomTom Car Kit should experience a better GPS experience with their iPhones, since the car kit comes equipped with its own GPS module, one that's superior to the iPhone's: It's similar to the receiver that TomTom integrates into its larger stand-alone GPS devices, and it features a more robust antenna design. 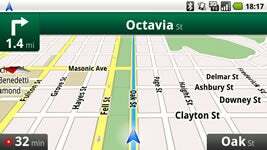 While the TomTom iPhone app is a freestanding navigation program, Google's Android navigation software lives inside the phone's Google Maps app. Originally available only on the Android 2.0-based Motorola Droid, Google Maps navigation has now made its way to Android 1.6 devices as well. Android 1.6 users can download the app from the Android Market. We took it for a spin on a Verizon-connected Droid. Rather than begin by picking a method of entering your destination, you're given a bird's-eye view of your current location from the start. To begin navigation, you hit the menu button in the Google Maps app and tap Directions. From there, you're presented with a field to enter your destination, and you select options to navigate by car, by public transit, or on foot. The differences between pedestrian navigation and automotive navigation can be significant, particularly since pedestrians aren't restricted by one-way streets or footpaths that would be inaccessible by car. Having the option to toggle between these modes is a massive point in Google Maps' favor. Add to that the ability to automatically compile a list of bus, ferry, and train routes complete with schedule information, and you've already got the best navigation experience I've seen on any phone. The navigation itself is great, too. As I've already mentioned, the Droid managed to maintain a GPS signal throughout our test, even at times when the iPhone lost communication with the satellites. What's more, the Droid established its connection more quickly than the iPhone at the time the app launched, and it refreshed its directions more quickly than the iPhone whenever we took a wrong turn or otherwise deviated from its instructions. On a couple of occasions, the directions from the two devices varied. Though judging the efficiency of the directions is unavoidably subjective, my copilot and I both agreed that the Droid's choice of routes was a bit better than the iPhone's. Google Maps also includes real-time traffic information as a data layer, which adds value by letting you see which parts of your journey are likely to result in delays. While both devices offer voice-guided turn-by-turn directions, we preferred the clarity of the Droid's voice directions to the iPhone's, but felt the iPhone gave us distance information more effectively. In our tests, the Droid did a much better job at pronouncing street names than did the iPhone. When we arrived at our destination, Google Maps capped off its superior run on the course by presenting us with a Google Street View image of the address we were looking for. Both TomTom for iPhone and Google Maps for Android are excellent GPS tools that should get their owners to their destinations with ample efficiency. However, it wasn't hard to choose a winner in this showdown. The Droid's free, built-in software is so well integrated with its Maps app that it offers a seamless navigation experience the iPhone just can't rival at this time. Though we liked the simplicity of TomTom's 3D map images better than the slightly more complex images afforded by the Droid's higher-res display, the Droid beat the iPhone in quickly refreshing directions to compensate for wrong turns. In the end, the Android navigation tool was simply superior on most counts--including, obviously, the price. Of course, these two apps are available only on totally separate platforms, and almost nobody is likely to switch handsets over the quality of the phone's GPS experience. If you haven't noticed, iPhone users have built a reputation for loyalty to that device. However--assuming you're on the fence about your next smartphone purchase and are not locked in to a particular carrier--which phone will do a better job of getting you where you want to go? The answer to that question today is the Droid.